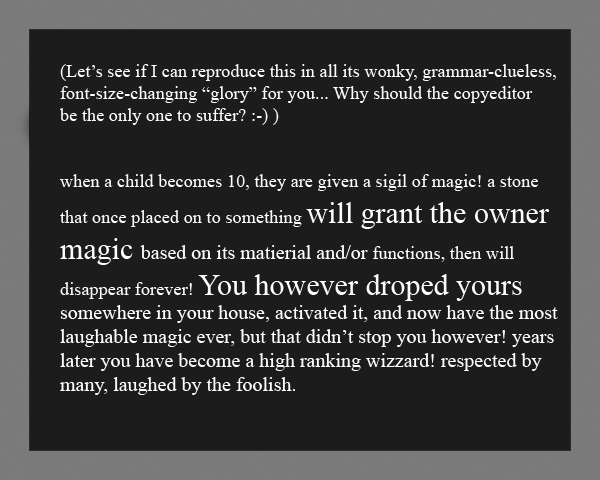 Delete the exclamation mark after magic; the sentence isn’t finished yet. When a child turns ten, they are given a talisman: a stone that, once placed on something, will grant the owner magic based on that object’s material or function. Then the stone will disappear forever. You, however, dropped your stone somewhere in your house, activating it, and ended up with the most laughable magic ever. That didn’t stop you, though. Years later, you’ve become a high-ranking wizard, respected by many and laughed at only by the foolish. It has already become a running joke between us: “So… about serial immortality.” Y’see, we started to have a conversation about this topic (strictly as it relates to writing fiction — we’re not that weird), but we kept going off on tangents (you’re soooo surprised, right?) about other things, so it took us two days to finally get back around to talking about serial immortality as it relates specifically to the characters in Paul’s novels. Nor are we finished with that topic yet. Backstory Revision Syndrome… I imagined one character shouting at his author(s), “I used to be human!” Not that he has anything against people who aren’t human, but he’s having a difficult time of it, dealing with this new knowledge about himself. (What, you mean you don’t allow your imaginary friends story characters the opportunity to express themselves out-of-story? *shakes head*) And there has been a revelation about the person behind a major aspect of Jon’s “origin story.” Fun times. For the past few days, Paul has been trying to work out the details and effects of extreme time dilation (I think he said it’s about one to twenty-six thousand!) in the non-causal reality inside a ginormous black hole (it’s most of the mass of an entire universe, although to be fair, it’s a rather small universe), versus outside it, and also the best/most interesting way of an individual or an entire culture/species achieving serial immortality through technology. Personally, I’m hoping he leaves some of the latter to be figured out in some other story, or even just leaves it alone entirely because the character(s) affected don’t know how it works, only that it does work. Having enough trouble choreographing the plotlines (just like old times, eh?) and making sure there was time for events to happen in the right order. It’ll all work out eventually, though, just like it always does. The possessive form of victim is victim’s. It is standard to say movements instead of movement in this context. The target is a loaner? As in, either the target is someone who loans things, or the target is on loan? (“Need a victim for your next serial killing, but don’t want to make a long-term committment? Come on down to Evil Rupert’s Serial Killer Emporium and just borrow one! We’ll loan ’em to ya for the best price around, guaranteed, or the next one’s free!”) No, I am quite certain the writer meant loner, meaning someone who tends to be alone. Add a comma after disappears. Delete the comma after notices. 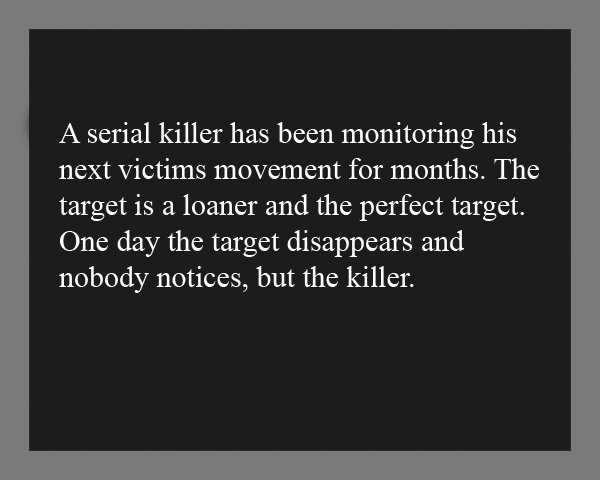 A serial killer has been monitoring his next victim’s movements for months. The target is a loner, the perfect target. One day the target disappears, and nobody notices but his would-be killer. Still too many uses of target in such a short paragraph, in my opinion, but maybe it at least shows the serial killer’s obsession with his intended target. Oh, one of these again, a “Psychology Says” meme, so you know it’s gonna contain nonsense as well as grammar/punctuation problems. 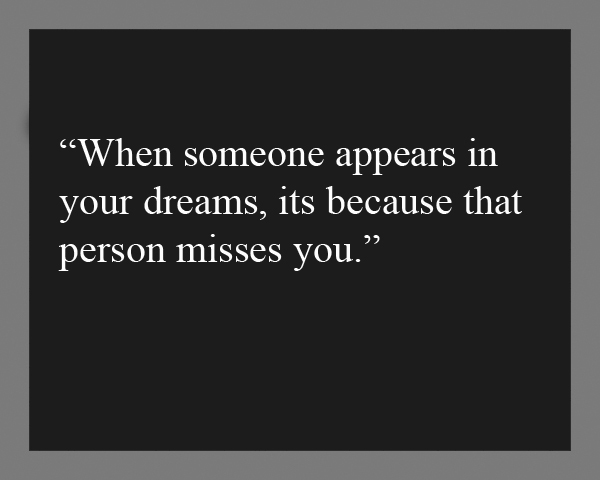 By what mechanism is this alleged dream connection supposed to work? 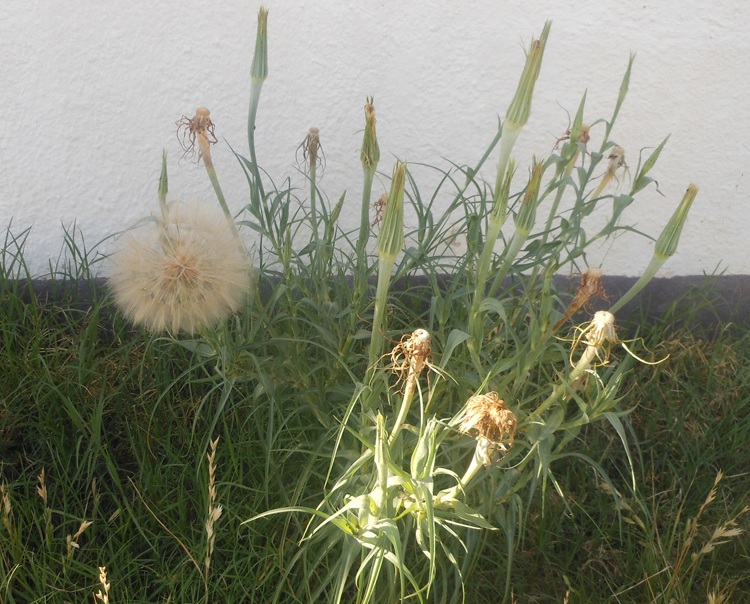 Could it be… psychism? ‘Cause Psychology really, really hates anything like that. If you can’t see why this particular “Psychology Says” is nonsense, I can’t help you. I can help you understand basic punctuation rules, so that’s what I’m doing. The first part of this is copied from an older post (which you can find here). You believe something such as All cats hate water. Then you see a video of a cat jumping into a bath tub to play, and you think, I don’t care if that cat jumped into the water to play. Everyone knows all cats hate water, so that cat hates water. In fact, that cat is a bad cat for doing things that are contrary to what everyone knows is true about cats. Who does that cat think it is? What is it trying to prove? Why can’t it just be the way I know all cats are? That cat is sick and tired of hearing that all cats hate water. He worries that he’s not catting “the right way,” because he likes water, especially warm water in which a rubber ducky is floating, and he’s quite good at swimming, and it upsets him a lot when people who don’t even know cats very well say cats must hate water, Because Felinity. Am I not a cat at all? he wonders. If I am a cat, why don’t I count? Why can’t these people who see me playing in the bath tub accept that, since I am a cat and I do like water, obviously some cats like water? I’m also damn good at communication, especially but not limited to written communication. (Several of my university professors seemed to think that I’m exceptionally good at public speaking, etc., which proves one need not enjoy something in order to be highly skilled at it.) However, it seems as if the more I try to convince people that, since I am autistic and am able to communicate quite well, it must mean at least some autistic people can communicate — even with allistics — quite well… they just double down on their insistence that autism means inability to use words/communicate at all, and then they usually add that obviously I also lack empathy, because otherwise I’d agree with them when they call me retard and say I don’t know anything about grammar. All that stuff I’ve mentioned occasionally about ‘supporting myself and even helping put my clone-sibling through college with money I earned as a freelance copyeditor’? True story, but it apparently doesn’t count, Because Autism. You’re very lucky, you stubborn individuals who have kept reading thus far, that you’re only reading my words instead of hearing them spoken. When speaking, I usually express emotion to some degree or another, which is totally against the Autistic Person Code of Behavior, as created by non-autistic people because actually autistic people can’t be trusted to be themselves without a real allistic person telling them who those selves are. Making eye contact is Against the Rules (and not making eye contact is proof that we’re defective). Showing empathy at all is Against the Rules (and showing empathy differently from how allistics do it is proof that we’re defective). Having many, many interests is Against the Rules (and having only a few interests is proof that we’re defective). Being physically coordinated/not clumsy is Against the Rules (and any difficulty with physical motion is proof that we’re defective). Not caring about math/computers is Against the Rules (and being interested in math or computers is proof that we’re defective). Dressing the same as allistics is Against the Rules (and making our own choices about what garments to put on our own bodies, with little or no regard for what’s trendy that week, is proof that we’re defective). If you were hearing me speak, rather than just reading my words on a screen, you would hear the anger, the frustration, and the confusion in my voice. You might even be tricked into thinking that I can hear such things in the voices of normal people, when normal people are expressing those emotions through speech. Of course, even caring what anyone else thinks/feels is Against the Rules (and not putting everyone else’s thoughts/feelings before our own at all times is proof that we’re defective), so knowing what another person feels is Not Allowed for someone like me. ‘Course, neither is over-the-top sarcasm, yet here we are. I’m well aware that there’s a strong anti-intellectualism movement in this country lately, and although I would like to believe that none of the people who read my blog are anti-intellectuals, it’s not impossible that a few are. At any rate, if you are incapable of changing your view when presented with facts that show it to have been incorrect/inaccurate, you probably don’t belong here. My university degree is in art, my “day job” now is all about written English… but never think that means I don’t believe in the scientific method, even applied to real life (as opposed to “lab life,” I guess): When the observations don’t support the assumption, there’s a good chance the assumption is wrong. This handful of people who believed I was really, really good with the copyediting stuff until they found out I’m autistic and then decided that I must have been incompetent all along, Because Autism… No. No one has the right to “retcon” reality to suit their own prejudices. I was competent before, I am still competent, and what you now know about me has changed nothing except what you now know about me. If your opinion of me changed, based on your prejudices, that is not my fault. 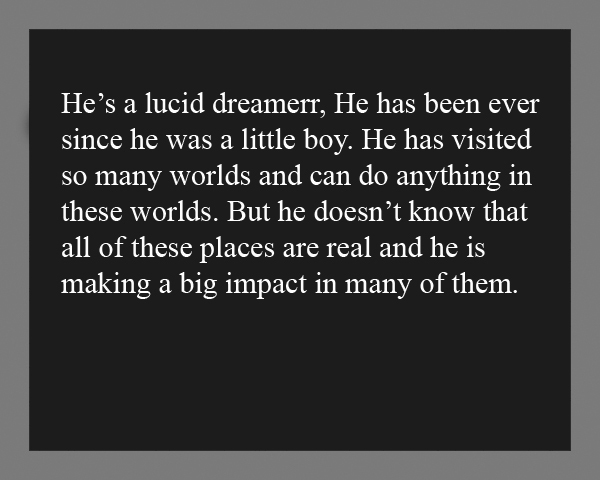 He’s a lucid dreamer; he has been ever since he was a little boy. He has visited many worlds and can do anything there, but he doesn’t know that all of these places are real, and he is making a big impact in many of them. The doubled r at the end of dreamer is clearly a typo. Change the comma after dreamer to either a period or a semicolon; if you use a semicolon, don’t capitalize he. He has visited so many worlds that what? Either add something to this sentence after worlds or delete so. Add a comma after worlds (or whatever you decide to add into the sentence following that word). Ending both parts of this compound sentence with the same word (worlds) makes it sound a bit clunky. (Yes, really: It sounds to me as if the sentence is making a sort of dull, flat thud at the end. Or it moves awkwardly. Or something. The trouble with even extremely mild synesthesia is that there’s no standardized language for describing it… and now I’ve gone and unintentionally compared myself to that other guy again. *sigh* At least I’ve got a handy semi-quote from one of his “book-cousins” for describing how the lack of ways to describe an idea feels, right?) Consider replacing one worlds with a pronoun or a different noun. Add a comma after real because the sentence is compound. It is generally considered inappropriate to use exclamation marks in narration, because it comes across as hyperbole. Save ’em for dialogue or for first-person narration (which is much like internal dialogue anyway). 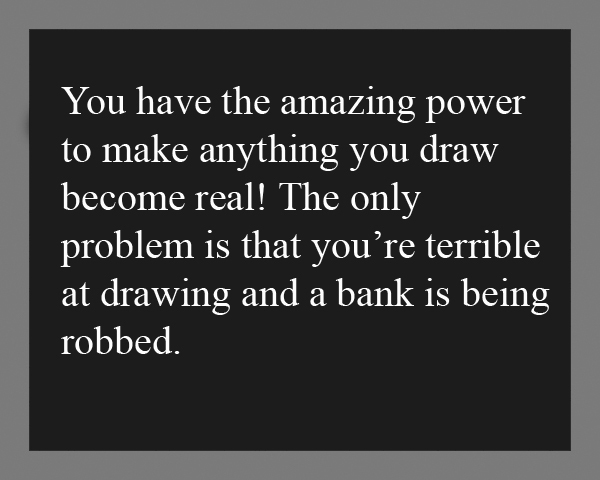 There is no clear logical/cause-and-effect connection between ‘you can’t draw’ and ‘a bank is being robbed.’ To fix this, the sentence/paragraph needs a transition, some way to show why the bank robbery is relevant to both the ‘amazing power!’ and the problem. You have the amazing power to make anything you draw become real. The only problem is that you’re terrible at drawing, and you don’t have time to become better, because right now a bank is being robbed, and you have to stop the robbers.